The cities of the West have a wealth of impressive public green space offering recreation and relief. I have idled in parks across all five Burroughs of New York City, and while I have enjoyed my time in their diverse scenery, I have been unable to escape a nagging feeling of social claustrophobia. It is impossible to find that sense of intimacy that I discover in larger more isolated state parks. It is not simply privacy that is lacking. The Japanese refer to the feeling I long for as Yugen (幽玄), and the west has cultivated this sensibility mostly from mountain-top vistas. Yugen is seeing an expansive forest, the distant opening in a rocky valley, and being content leaving its mysteries unsolved. I have found a compromise between the culture and spaces of urban centres and the physchological comfort of rusticity only in the parks and private gardens of Kyoto, Japan. While the city’s most famous gardens are inundated with a constant flow of tourists, there remains a well-dispersed network of temple complexes and historic town houses buffeted from the mobs. Here are hidden gardens that retain the highest quality artistry, where one can cultivate the illusion of solitude. 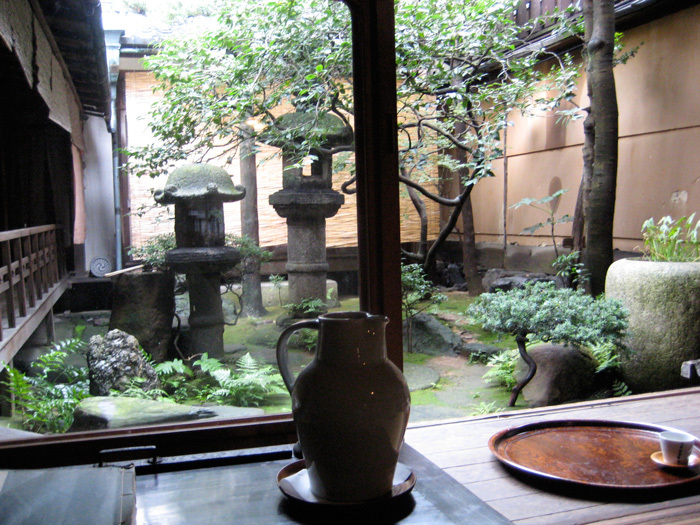 I believe the secret lies in a combination of density and enclosure, and no example of these principles is more striking than the so-called tsubo (壷) gardens of the traditional Kyoto town house. The term tsubo refers to a crockery pot and in the context of landscape design is a reference to the towering lipped walls that enclose a residential urban garden. The phonetic pronunciation of tsubo (つぼ) can also refer to a measurement of area that is approximately 3.2 meters square (坪) which is consequently only a bit smaller than most tsubo gardens. Within this compact space one can fit a surprising variety of shrubbery, well-manicured trees, delicate mosses, ominous stone lanterns and water basins. The walls cut out the sprawling city and offer a finite area. A feeling of expansiveness is retained, however, because the garden is not meant to be entered, but viewed at a distance from a veranda. The compacted space ensures that this formula can be duplicated at a relatively low cost without sacrificing population density. Andrew is a landscape designer at Sticks and Stones, a moss farm, stone yard, and sculpture park in New Town, Connecticut. He studied Japanese art at Columbia University and Japanese gardening at Kyoto University of Art and Design. He began a traditional apprenticeship with Teiyu Garden Design in Kyoto, and plans to continue in the Spring of 2011.